Implement Corporate Leadership Development programs that successfully promote women to decision-making positions. We offer Corporate Leadership Development Programs for your multicultural employees, particularly Hispanic women. Our deep cultural knowledge plus our years of experience in the field, led to this Corporate Leadership Program— A sustainable turnkey solution that truly resonates with your diverse talent. The research proves it: The higher women climb in the organizational pyramid, the higher the return on investment for your organization. The question is, how to balance the need to increase diversity at the highest levels with the cost of developing a sizable number of women. The answer is simpler than you’d think. Appeal to your employees’ self-motivation and put them in charge of their own careers! This Corporate Leadership Program is a sustainable turnkey solution for your company. As a result of it, participants break with subconscious mandates that often get in the way of their career growth. They attain the necessary skills to take on challenging projects and move up the ladder, making it easy to promote more women to decision-making positions! The RSM Circles are corporate leadership development programs that live and grow within your company! The RSM Circles are an effective way to accelerate diverse employee growth by inviting them to take charge of their professional development. Nine sessions specifically structured to prepare your women to assume management and leadership positions. Using our mutual empowerment and experiential methodology, each session is coordinated by one of your employees with our detailed Facilitator’s Guide. This Guide provides exhaustive information to carry out each meeting. Benefits? This corporate leadership development program generates incomparable cohesion among participants. Working together to define individual objectives, sharpen negotiation and networking skills, refine their brands, and so forth, participants become invested in mutual growth. They also become a much more promotable group. Yes, I’d like to accelerate my team’s growth! Even though women have come a long way, we still face many obstacles to take the place in society we deserve. Some of those obstacles are external and subject to a change in mentality by society, but the ones we can do something about are in our own mind. A good step toward reaching the goal of personal growth for women is to talk about it with other women, encourage each other, identify the problem and find the solution. I always like to say that women can do the same thing men can do, but even better because we do it in high heels. If those heels are red, watch out. Nine powerful, 2-hours sessions, conducted once every other week by one of your employees. This is a flexible program that can be easily adjusted to your particular needs. Based on Find Your Inner Red Shoes by Mariela Dabbah, the book that started the Red Shoe Movement, it’s ideal for developing leadership qualities for Hispanic and multicultural women employees. 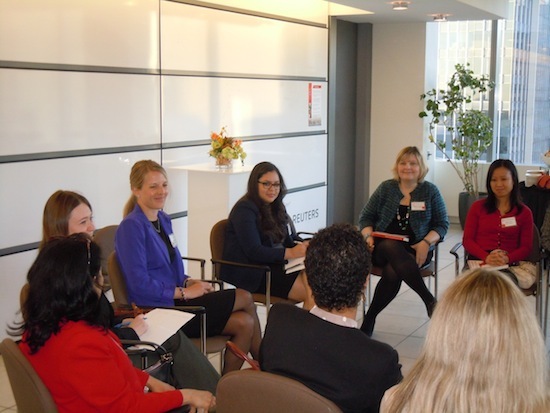 The RSM Circles offer an effective, low cost way to promote more diverse women to management positions. Contact us to discuss your needs and how we can assist you in bringing this outstanding corporate leadership development program that truly resonates with multicultural and Hispanic women.